The Preševo Valley (Serbo-Croatian: Прешевска долина, Preševska dolina, Albanian: Lugina e Preshevës) is an area composed of the municipalities of Bujanovac and Preševo. Geopolitically, the region is the center of the Albanian community in Serbia with Albanians comprising 54.6% of Bujanovac and 89% of Preševo (and 26% in Medveđa). Geographically, the Preševo Valley is coterminous with the river basin of Preševska Moravica, from its source near the town of Preševo to the confluence with Južna Morava at Bujanovac. It is part of the Morava/Vardar North-South route across the Balkans, which follows the flows of Great Morava and Južna Morava through Serbia. This route carries the pan-European corridor X and E75. The importance of this route to the Serbia has increased since 1999, when the main alternative route, through Pristina, became unusable due to the Kosovo War. In 1938, during the colonisation of Kosovo, Preševo was designated in the Turko-Yugoslav Convention as one of the areas whose population would be forced to migrate to Turkey. In 2001, as a follow-up to the Kosovo War, there were clashes between Serbian security forces and ethnic Albanian guerrillas linked to the Kosovo Liberation Army (KLA), known as the Liberation Army of Preševo, Medveđa and Bujanovac (Albanian: Ushtria Çlirimtare e Preshevës, Medvegjës dhe Bujanocit, UÇPMB). 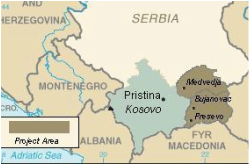 The aim of UÇPM was to take full control of Preševo, Bujanovac and Medveđa and hold them until such time as the adjacent lands, Kosovo and Western Macedonia, also came under Albanian control. This should have been followed by the gradual opening of the borders. Lacking the attention of the international media, the incidents paused as the activities spread south of the border into Macedonia from where the twin organization National Liberation Army, engaged in a war against Macedonian authorities. The Presevo valley conflict ended after international intervention that led to peace treaty, which demilitarise the area, amnestied UÇPMB and granted to the Yugoslav army entry to the region under NATO's approval.In September 2007, Boris Tadić stated "that former and current terrorists, who recently managed to escape from prison in Kosovo, were located in northern regions of the Republic of Macedonia". According to Tadić, "terrorists are planning new attacks on municipalities in southern Serbia in order to start a new Preševo Valley conflict".